It’s hard to believe that we are already in week three of resident camp at Camp Conowingo–time really does fly when you’re having fun! 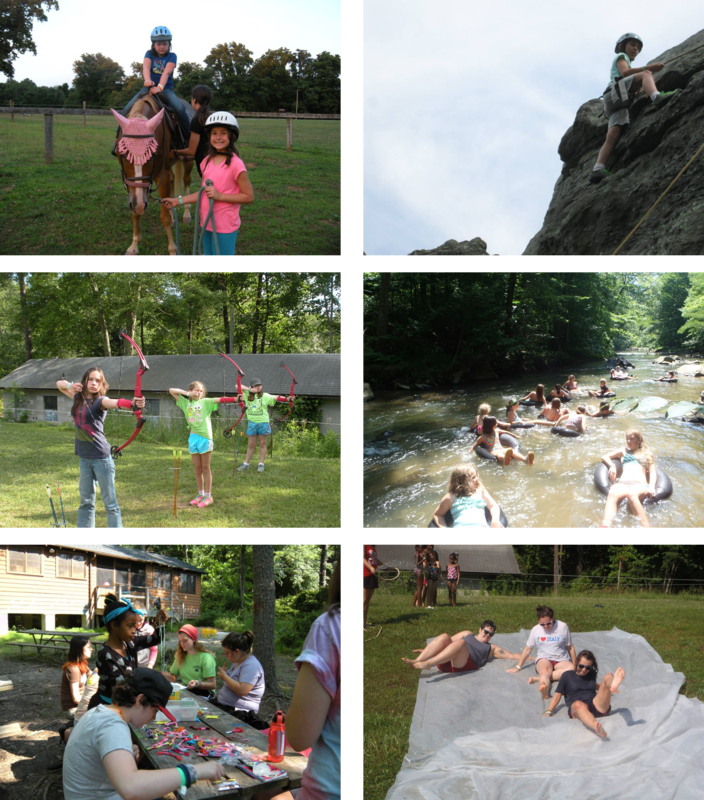 So far girls have been enjoying traditional camp activities like singing songs, having campfires, swimming, hiking, making new friends, doing cool arts & crafts projects and making s’mores as well as participating in a ton of other not-so-traditional activities at Camp Conowingo! In week one, while some girls enjoyed horses, archery and canoeing, others pampered themselves by turning their unit into a camp spa complete with soothing music, natural beauty products and a chance to unwind by floating in the pool, writing in their journals and doing yoga. Another group of girls had their survival skills tested as they survived their troop’s (make-believe) camping trip in Yellowstone National Park. In week two, girls got their hands dirty in the gardens at camp to discover why worms are so important. These girls were also able to harness their creativity to make mosaic flower pots, learn to press flowers and host a garden party! Our group of Rainbow Weavers were also able to be creative during their week of weaving and macramé while the Rocks, Ropes & Rappelling girls learned the three r’s of rock climbing and spent four adventure-filled days at Rocks State Park where they learned knot tying, belaying techniques and climbing movements all while having a blast! This week, our youngest campers are learning how to turn everyday items into gadgets, gizmos and goo while older girls are learning how to create combine style, imagination and eco-consciousness to create one-of-a-kind clothing designs from recyclable materials. There’s always so much going on at camp ! If you are a parent of a camper, make sure you keep up with your girls by connecting with the Camp Conowingo Resident Camp Parents Facebook Group and Bunk 1. If you have not registered your daughter yet, do so ASAP! Sessions 5 and 7 are FULL and the others are filling up fast! This camp will take place on July 6-11, 2014. This camp will take place on July 13-18, 2014. This camp will take place on July 20-25, 2014. This camp will take place on July 27-August 1, 2014. This camp will take place on August 3 – 8, 2014. Have questions? Check out our Camp FAQs page or contact Megan Hardy at mhardy@gscm.org.